Below is the quick version of our trip to the Gulf Coast, though I realize it seems rather long. Click here to check out our photos. Read the entries below for details on various aspects of our trip, written topically rather than chronologically. Friday, March 16: After work, we drove from our home in Silver Spring MD, through DC, down to Blacksburg VA. It was sleeting when we left, and snowed a bit as well in Virginia. It took us about 5 and a half hours. We spent the night with our friends Ryan and Elyn. Saturday, March 17: We listened to Irish music in celebration of St. Patrick’s Day as we drove from Blacksburg through southwestern Virginia, eastern Tennessee, the northwestern corner of Georgia, across Alabama, and into Mississippi. We got to Hattiesburg MS around 6 pm CDT – the trip took about 11 hours. 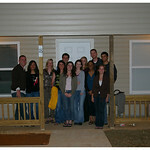 We moved into our volunteer housing, a Habitat home that had been turned into a bunkhouse for 12 people. We were the first ones to arrive. We drove around Hattiesburg a little bit – a cute university town (home of University of Southern Mississippi) but perhaps struggling a bit economically. Sunday, March 18: We got up early and met one of our Site Supervisors, J.R. We also met the group that had arrived late the night before and was staying in the bunkhouse next door – 12 students from the University of Maryland Law School. 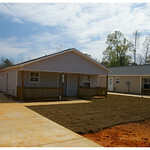 J.R. gave us various projects in the three Habitat homes across the street, which were in various stages of completion. Dave and I installed a doorjamb in the kitchen, and helped a pair of law students install a vanity in the bathroom. Since the week promised to be full and intense, J.R. only had us work a half day. We all had lunch around noon and then the law students went off to go canoeing. Dave and I spontaneously decided to do the two-hour drive to New Orleans to see how it’s recovering. (Read the report in “On Katrina“.) Before heading back to Hattiesburg, we had dinner at the home of our friends John and Christy in Jefferson Parish, and heard some stories about the difficulties of living in a city that is having difficulties coping with post-disaster realities. Monday, March 19: The build team gathered around 7:30 am, now including not only us and the students from UMd, but also a family of three from Seattle and a group of 20 or so people from a Baptist church in Bethlehem, PA. Two men from this group were our new housemates, and the rest were staying in hotels nearby. 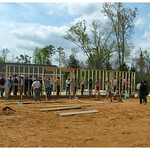 The main goal for the day was to frame the walls for a new house, which at the beginning of the day was only a cement pad next to the three in-process homes. In addition, there were smaller jobs that needed to be done in some of these houses. 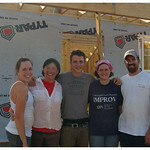 Dave became a leader on the team framing the new house, while I and a girl from UMd put moulding around inside door frames at the most completed house. We finished up close to 5 pm — a long day of construction! The law student invited us to join them for a yummy home-cooked dinner, then we all went out bowling. Tuesday, March 20: Once again getting an early start, Dave continued to head up the framing team, leading the crew on putting up inside walls. 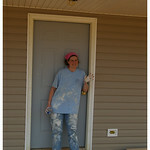 I ended up heading up a paint crew in the second-most completed house. A new group had been added to our team, a bunch of undergrads from Earlham College in Indiana. They made a great paint crew, and we got the inside ceilings and walls of the entire house primed and ready to paint the next day. After work was done and we were cleaned up, Dave took me out to dinner for my birthday at a cute locally-owned pub called the Keg and Barrel. Wednesday, March 21: The law students had left but we still had a good sized team. Dave kept up the work on the new house, and I helped out for a while putting up some of the ceiling joists. Starting mid-morning, I oversaw a new group from Earlham College to paint the walls and ceilings of the house I was working on the day before. It was another full day of work. Afterwards, Dave and I picked up take-out barbecue from a local place and took it to have dinner with our friends Sue, Ellen, and Will, the family from Seattle. They were staying in a cabin on a lake at a state park about 10 miles down the road. It was a fun and relaxing evening. Thursday, March 22: The Earlham College students moved on to do some work down in New Orleans, and most of the folks from the Baptist church had formed their own crews working on smaller projects such as patio roofs. That meant that Dave’s crew, which had come to the point of starting to put the roof beams on top of the house, consisted of the family from Seattle and our Site Manager, Mike. It was slower going than earlier in the week. I helped for a while, handing up roof beams as they were being cut. I later did some cleanup and detail work on the third house, to get it ready for Monday’s inspection before the drywall could be put in. After work, Dave and I drove around the Hattiesburg area, inspecting some of the hurricane damage and also general state of Hattiesburg. We had a very unhealthy but very tasty dinner of Gulf Coast style fried seafood. 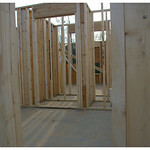 Friday, March 23: Dave continued to work with Mike, Will, and Sue on getting the roof up. He had help from a few new individuals: two local women who volunteer every Friday. Ellen and I were tasked with a couple of other projects on this house, and were fortunate to have a few hours of help from a couple of great local college students both named Lindsay. We put weather-proof wrapping on the front of the house, then installed windows and sealed them. About halfway through the day, the folks from Pennsylvania headed out, and the job site got very quiet. By 5 pm, everyone was tired, and J.R. was ready to call it a day. The new house had most of the roof beams on it, and the windows were all in and sealed. It had been a good week of work, and we said farewell to our new friends from Seattle and to our great Site Supervisor J.R. Then we went to Keg and Barrel to watch the Hoyas beat Vanderbilt — hooray! Saturday, March 24: We gathered all our things out of the volunteer bunkhouse and packed up our car. We said goodbye to Mike, who told us we could come back any time. We hit the road around 9 am and headed toward Nashville, going back through Mississippi and Alabama. It took about 6 and a half hours to get there. We stayed with our friend Joyce, and had a chance to enjoy more Southern culture by eating at Jack’s Bar-B-Que and checking out a bluegrass concert. Sunday, March 25: We left Nashville at 8 am and drove for hours and hours, through eastern Tennessee and Virginia. We were so happy to get to I-66 and head toward DC. As we got into the DC area, we listened on the radio to the Eastern Division NCAA basketball game, in which Georgetown magically beat UNC to head toward the Final Four. Go Hoyas!